At Science in the City The Silver Frame, developed by the performance artist, Michael Richard will unfold as an artistic basis for dialogue about the room and the way objects, bodies and knowledge behave and transform within it. Through performative interaction, the artist will guide the viewer in crystalizing materials and concrete questions as to how Art may offer itself as a perspective and method for Science? 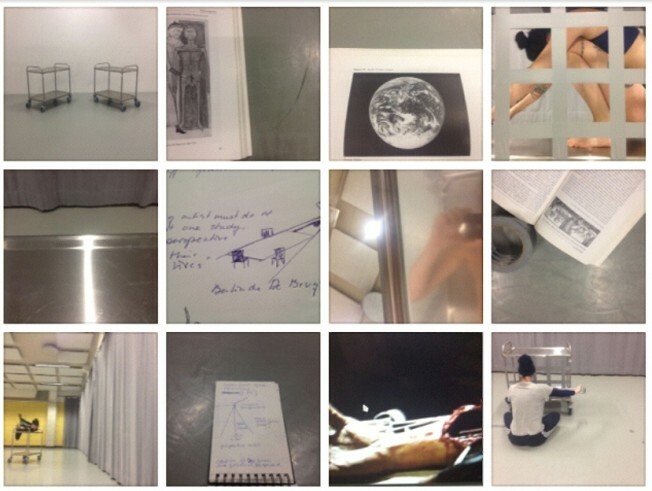 During the week the performance artists Inga Gerner Nielsen and Sarah Armstrong will be working with their project ‘embodying scienceS’ in an open residency within The Silver Frame. You may for instance come to meet them, as they’re playing with different ways of placing their bodies on two laboratory tables or exploring different perspectives in the room. This being part of the first development of a choreography of different images and figures brought into the laboratory of The Silver Frame. Some from the History of technological inventions of Science and others from psychoanalytical theories of Science Fiction. Some with reference to the experiments and modifications of the body done by performance artists before them. Through this work they seek to engage in a dialogue with each other, with Michael Richardt and the participants of Science in the City about performance art’s possible relation to science. About how the performance artist could be seen as both the scientist and his object; Frankenstein and his monster, simultaneously. A figure, presented here as a reflection on the possible ability of the performance artist to create her self in her own imaginary image. Reflections about whether we should place our bodies on tables, ready to let ourselves be shaped by technological as well as artistic inventions of the future? A critical discussion, which performance art and an installation such as The Silver Frame can help us focus and expand our view on.